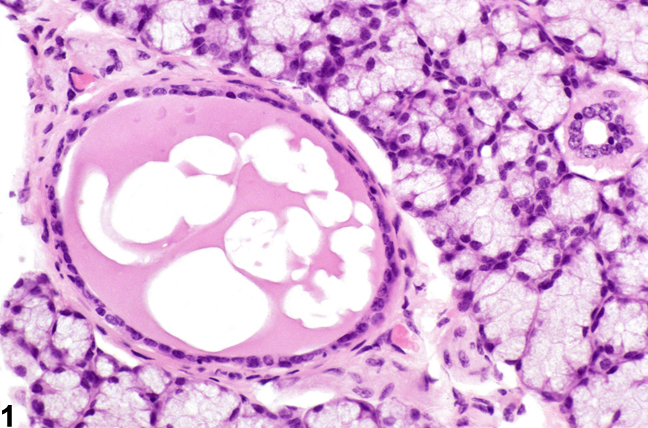 Salivary gland, Duct - Cyst in a female B6C3F1 mouse from a chronic study. The cyst is roughly circular, and the epithelium is somewhat flattened. Salivary gland duct cysts tend to involve one or a few ducts and usually have a circular profile ( Figure 1 ), whereas ductular dilation of salivary glands is typically more generalized (involving multiple ducts), and the ducts tend to have an irregular profile (see Salivary Gland, Duct - Dilation). Cysts may be caused by obstruction of a duct by calculi, trauma, or foreign body. Ductular dilation and ductular cysts are not common in NTP rodent studies. Duct cysts should be diagnosed but are generally not graded unless there is a treatment-related effect on the size of the cysts. 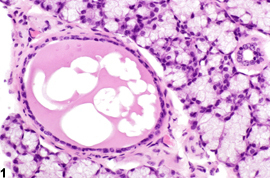 If squamous metaplasia of the ductal epithelium is present, it should be diagnosed and graded separately. Germann PG, Ockert D, Tuch K. 1995. Oropharyngeal granulomas and tracheal cartilage degeneration in Fischer-344 rats. Toxicol Pathol 23:349-355. National Toxicology Program. 1989. NTP TR-350. Toxicology and Carcinogenesis Studies of Tribromomethane (Bromoform) (CAS No. 75-25-2) in Fe44/N Rats and B6C3F1 Mice (Gavage Studies). NTP, Research Triangle Park, NC.